Designed by R. Castallo and P. Maubassin to a specification from the French Air Force for a two-seat, pure jet fighter trainer, Fouga presented a proposal for a tandem two-seat trainer to the French Air Ministry, the CM.130R which was powered by two 353 lbst (160kgst) Palas engines. 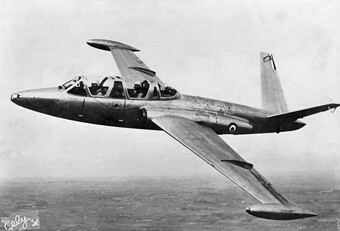 The design was refined and a contract for three of the resulting twin Marbore II powered CM.170R aircraft was placed with Fouga in December 1950. The Morane-Saulnier company were working along similar lines at this time, and their drawing boards sired the MS.755 Fleuret. Both companies had schemed aircraft which shared essentially similar configurational layouts. 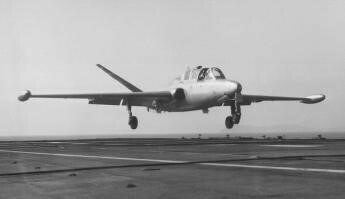 The CM.170 Magister featured tandem seating, a mid-mounted wing and two Marbore II turbojets mounted either side of the fuselage in nacelles faired into the wing-fuselage joint. The only unusual feature of the CM.170 was a butterfly tail, whereby fin and tailplane are replaced by two surfaces mounted at 45 degrees to the horizontal, the control surfaces of which moved the same way to act as rudders and moved in opposition to act as elevators. The Magister is all-metal. The mid-mounted wings have single-slotted flaps and airbrakes. The butterfly-type tail has surfaces separated by 110 degrees. Fuel is housed in two fuselage tanks of 255-litre and 475-litre capacity, with wingtip tanks each holding 125 litres. The tandem cockpits are pressurised and air-conditioned, with individually regulated oxygen supplies. Ejection seats are not fitted. VHF, blind flying equipment and radio compass are standard in the trainer, while UHF, Tacan and IFF may be fitted to armed Magisters. Armament combinations include two 7.5mm or 7.62mm machine-guns mounted in the nose, with 200 rounds of ammunition per gun. A gyro gunsight is fitted in both cockpits, the rear one having periscopic sighting. Underwing ordnance loads include two Matra Type 181 pods each with eighteen 37mm rockets, two launchers each mounting seven 68mm rockets, four 25kg air-to-ground rockets, eight 88mm rockets, two 50kg bombs, or two Nord AS.11 air-to-surface guided missiles. The first of three CM.170 prototypes flew on July 23, 1952, at Mont-de-Marsan (piloted by Leon Bourriau), while the MS.755 took to the air for the first time some six months later on January 24, 1953. Two CM.170 prototypes were built; the first with the butterfly tail and second with a conventional tail. Despite the crash of the prototype, the butterfly tail was used for the production series. The CM.170, MS.755 and MS.760 used only fuselage fuel tanks. The French Navy, also looking for a training aircraft, turned to Fouga for an aircraft for operations on aircraft carriers and the marine environment and Fouga worked on several changes to their CM170R. The Naval version, the CM-175 is distinguished by some changes. The canopy sliding backwards replacing the old, clamshell-type allowing flight and landings open. The new rear seat telescope is angled Z to allow the sliding of the front canopy. A tailhook is mounted under the rear fuselage. It retracts into the keel. A new long-stroke shock absorber increased the height of the landing gear 15 centimetres and absorb the shock of landing and catapult launches. Wing tip tanks are removable (but not releasable in flight). Their capacity is 122 lt instead of 230 lt equipping Air Force Magisters. The CM 175 is equipped with a G- II Marboré 3 which differs very little from the F-3 of the first series of Magister. Ties back journals are more flexible on the G-3. Turbomeca Marbore II equipped the Fouga CM175 Zephyr throughout his career. The prototype No. 1 CM 170 M Esquif, who would become the CM 175 Zephyr, was first flown on 31 July 1956, by Jacques Grangette. In addition to the two prototypes of the CM-170M Esquif, 28 aircraft were ordered and delivered from 1960. They were renamed Zephyr. Total CM.170 and CM.175 production amounted to 916 Marbore II powered Magisters, including licence production carried out in Finland by Valmet OY (62), Israel by Israel Aircraft Industries (36) and West Germany by Flugzeug Union Sud (188). Israeli aircraft upgraded at Bedek to AMIT Tzukit status. The first aircraft built in Israel was a Fouga Magister completed from French Components by Bedek Aircraft in mid-1960. In the 1960s, the Finnish Air Force had MIG-21 rockets in stock which had a limited lifetime. To use this stock for training purposes the idea of rocket launchers for Fouga Magister jet trainers was born. A contract to design the launchers as a private venture was issued, and with Aulis Eerola 4-tube units covered with fiberglass skin were built. In test firings the launchers proved to be accurate but had an unfortunate end. On one of the test flights the pilot accidentally pressed the emergency release button and the units were lost deep in a bog and were never found. The CM.170-2 Super Magister was an upgraded and refined CM. 170. The Magister is a sophisticated aircraft, with pressurised tandem cockpits and power controls (aileron boost), although in its standard form, it does not have ejection seats. To meet the latter requirement, particularly for Indian interest at one stage, a new version was produced designated the CM-173 Super-Magister. Military Users: Algeria, Austria, Bangladesh, Belgium (50), Brazil, Cambodia, Congo, Eire, Finland, France, Lebanon, Morocco, West Germany, Israel, Rwanda, Salvador, Senegal, Togo. The Aerospatiale Fouga 90 was a modernised descendent of the CM 170 with a deeper mid-fuselage incorporating a raised cockpit for the instructor, and fitted with a pair of Turbomeca Astafan IIG turbofans. The prototype F-WZJB flew for the first time on August 20, 1978. A much updated and redesigned CM.170 with a view to re-opening production, or establishing a conversion for the many existing CM.170 operators. The Fouga 90 featured the wing and empennage of the Magister, but coupled Turbomeca Astafan IIG engines with an all-new fuselage incorporating a stepped tandem seating arrangement, including built-in provision for ejector seats, and new avionics. Only one built, no further development was undertaken beyond the first aircraft. An evolution of the CM170, the Super Magister was an improved model with two 480kg Marbore VI engines. The first flight was June 8, 1964. A single copy was built which was then be renamed Potez 94. Equipped with 2 Marboré VI, the Potez 94 was pressurized and had ejection seats. 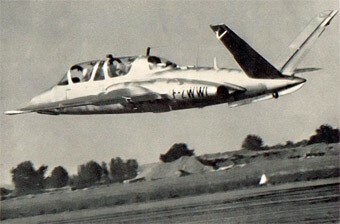 In addition to French-manufactured Magisters offered for export, the trainer was manufactured under licence in West Germany by Flugzeug-Union-Sud for Luftwaffe training schools. With the transfer of most German flying training to the United States by the end of the 1960s, the Magister was phased out of service. Valmet OY in Finland built 62 Magisters under licence (in addition to 18 purchased from France) and Israel Aircraft Industries also acquired manufacturing rights for the type, building many for light-tactical use as well as training. Total production reached 929 including 194 in Germany, 62 in Finland and 36 in Israel. About 310 Magisters of the 437 originally procured remained in service with the Armee de I'Air until the mid-1980s. A 150-hour basic flying training course was provided for commissioned pupils at the Ecole de I'Air at Salon-de-Provence, and similar instruction was provided for other ranks at Groupement Ecole 315, Cognac. Magisters also served with Groupement Ecole 313 to provide instructor training for the Armee de I'Air and basic flying training for overseas students. 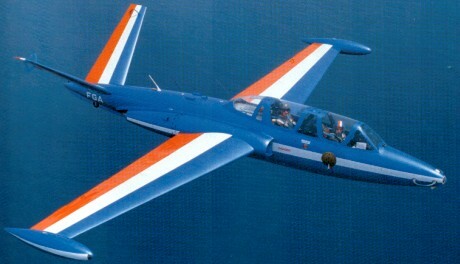 The Force Aerienne Belge's Magisters at the Ecole de Pilotage Avance, Brustem, were replaced by Dassault-Breguet/Dornier Alpha Jets in 1979. Finland's Magisters at the Central Flying School, Kauhava, were in the early 1980s replaced in service by the first of 50 British Aerospace Hawk trainers. Israel operated the Magister as a light attack aircraft and trainers, during the Six-Day War of June 1967, flying ground attack sorties on both the Egyptian and Jordanian fronts. The Irish Army Air Corps also operated six Super Magisters in the dual light attack/training role, based at Baldonnel near Dublin. Engines: 2 x Turbomeca Marbore IIA, 400 kg / 880 lb thrust. Wing area: 186.1 sq.ft (17.3 sq.m). Empty wt: 4740 lb (2151 kg). Normal T/O wt: 6280 lb (2851 kg). MTOW: 7055 lb (3202 kg). Internal fuel cap: 160 Imp.Gal. (727 lt). External fuel cap: 55 Imp.Gal. (250 lt). Wing loading: 33.7 lb/sq.ft (164 kg/sq.m). Pwr loading: 3.6 lb/lbst (3.6 kg/kgst). Max speed: 432 mph (695 kph). Initial ROC: 3350 fpm (17 m/sec). TO dist 50 ft: 2600 ft (793 m). Range: 575 sm (925 km). Engines: 2 x Turbomeca Marbore VI, 1150 lb thrust.